In Jame's Porter's essay "Intertextuality and the Discourse Community", Porter discusses the importance of a discourse community, individuals bonding over a common interest over a communication channel. In this case, we are focusing on Facebook, where fan pages and mutual conversations can spark conversations. Facebook allows a person to post links to other websites and videos to spark conversations with people from anywhere around the world. 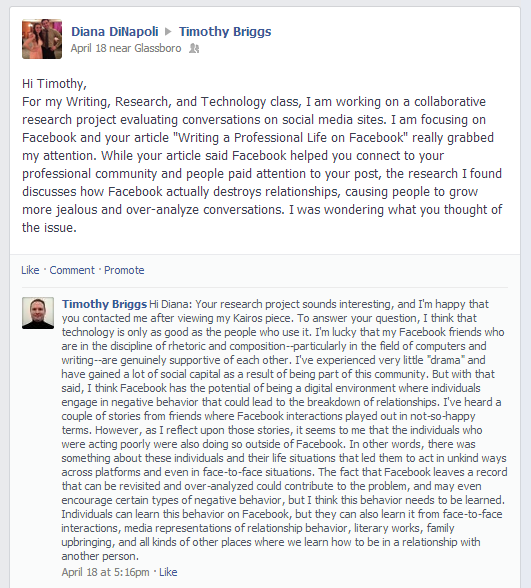 In Timothy Brigg's video "Writing A Professional Life on Facebook", he talks how he utilized Facebook while conducting his research. 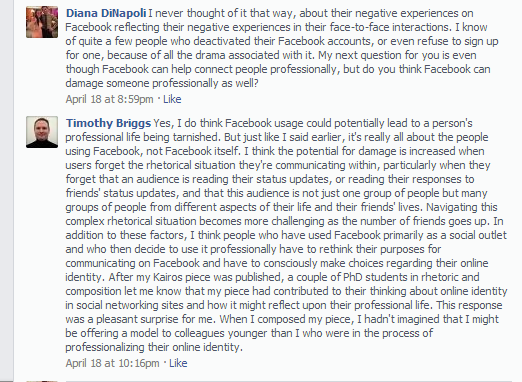 Although many people believe their Facebook comments go unnoticed, Briggs argues, saying people pay attention to the comments. Before Facebook, he felt disconnected to his colleagues around the nation. However, now he could gain new ideas from other professors around the world. The conversations go beyond just posting words, being able to show various YouTube videos and links to show his teaching philosophies and student projects. When I contacted Timothy Briggs on Facebook, I mentioned some of the negativity Facebook carries, which you can read more about here. To sum up the conversation on the left, he says those who experience drama on Facebook have experienced drama in real life and are taking it out on the social media outlets. Still, he believes Facebook has the power to create digital relationships around the world.